I have become a little addicted to turmeric these days. I love the earthiness of it and have enjoyed it in yellow curry powder for years. A while back, I found it at my local supermarket fresh, not dried. I couldn’t believe it. It looks a lot like ginger root, but when you peel it or cut it open, it is a vibrant orange color. The first time I saw it, I hadn’t even imagined you could get it in its original state. I thought it was only available as a dried powder. I didn’t really know what I was going to do with it, I just knew I needed to have it. Turmeric has a ton of health properties. It is being increasingly reported on for all of the potential that it has. Some of the benefits of turmeric include its antioxidant, antiviral, antibacterial, antifungal, anticarcinogenic, antimutagenic and anti-inflammatory properties. Some reports say it can prevent prostate cancer, increase insulin sensitivity, treat arthritis, reduce cholesterol, prevent Alzheimer’s, and several more things as well. Even if it has half of the health benefits that it seems to, it’s worth adding to your day. Especially when you love it. It makes things a gorgeous color too. Be warned, however, because it can stain counters or sinks if you leave it on there. I haven’t really had a problem with it, but I do notice it. Some people find the taste a little overpowering, though, so go easy the first time and see what you think. This recipe made my heart happy so I think you should try it and see what you think yourself! 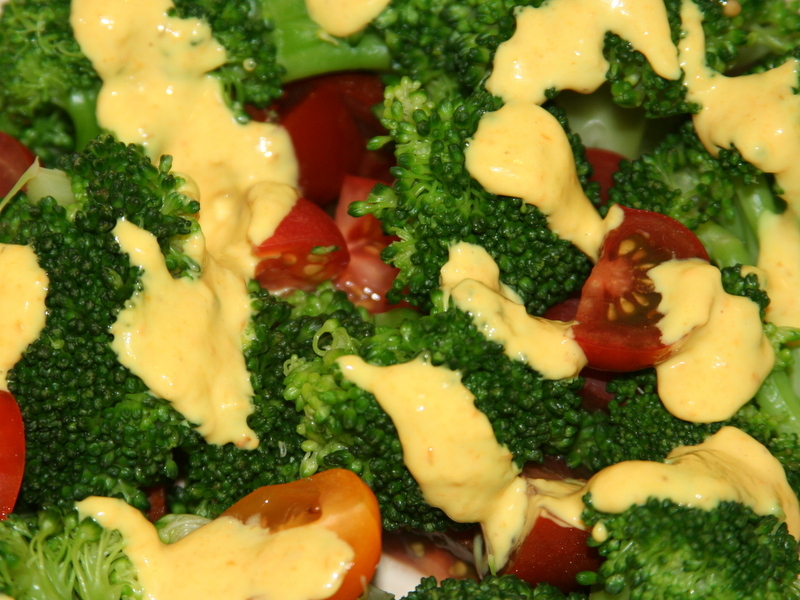 I ate it with raw broccoli and then this broccoli-tomato salad and then off the spoon. Then I had it on my eggs in the morning. So good! Combine everything in a small bowl and allow to sit for a few minutes so the flavors can blend. I had a red pepper that needed to be roasted and I had half an avocado. I wanted to do something a little different that would make everything it touched taste better – and this little sauce, spread, dip, whatever you want to call it, does exactly that. It’s super creamy and the roasted bell pepper gives it great depth, but there’s a brightness to it too from the squeeze of lemon. It is just oh-so-good. I can’t get enough of it. So far, it has topped burgers, slices of cold chicken breast, hard boiled eggs, and I dipped a couple snap peas in too. I’m thinking of tossing it with some sautéed zoodles and might have to make another batch to experiment with a few other options. I am absolutely loving it. Sometimes people mention that they’re bored with what they’re eating or that their meals lack variety. One way to avoid that is to come up with different toppers or herb combinations that keep your staples feeling fresh. 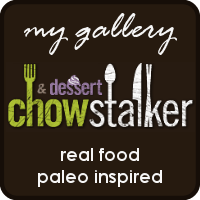 Burgers really fall into this category for me because on a Paleo journey with a budget-conscious mind, ground meat comes into play quite regularly. 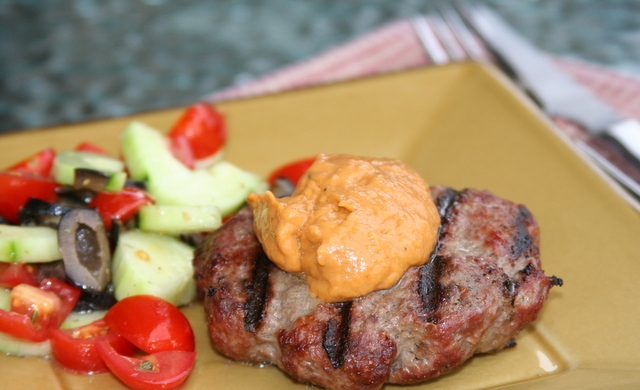 There are all kinds of ways to dress up a burger and not all of them include bacon either! If you’re looking for something new, consider this lovely little spread – and let me know what you think! 1) Preheat a BBQ over high heat (or the broiler works too) and place the whole pepper on the grill. Close the lid and let the pepper get black. Flip the pepper and continue blackening all sides. It should also be getting a bit soft. Once all sides are black, place the pepper in a container with a lid and let it cool down, steaming and continuing to soften. Once cool, peel off and discard the blackened skin. Remove any seeds but try to avoid rinsing the pepper in order to maintain maximum flavor. 2) Place the roasted pepper in a blender or food processor (I used a Magic Bullet) and add the remaining ingredients. Blend until smooth. Taste and adjust seasonings and then spread it on everything! *Note: A jarred roasted bell pepper would probably work as well, but the flavor might be a little more astringent and lack some of the smokiness. You could try countering that with a tiny pinch of smoked paprika. This is the first year I’ve had a vegetable garden and my only regret is that I have let so many growing seasons pass me by. It is rewarding, exciting, beautiful, and delicious! Chard, basil, and zucchini have been in full swing for a few weeks now so I’ve been making batches of pesto and either using it throughout the week or freezing it for later. It seems that every time I cut a bunch of basil down, I am rewarded the next day with fully grown and happy plants again. The weather must be just right this year and I am very grateful! Pesto typically has cheese in it which gives pesto some depth and richness and a certain mouthfeel. As I’ve continued to make this version, though, which is dairy-free, I’ve realized that I actually like it without the cheese. The individual flavors stand out a little bit more, and not in a bad way. I particularly like tasting the richness of the toasted pine nuts which seem to really shine here. 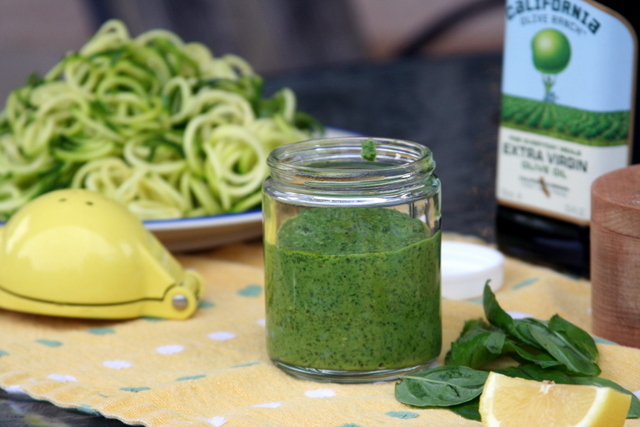 If you’re wondering what to do with a bunch of pesto around, here are a few things that I like to do: Dollop it on eggs; mix it with tuna and chopped tomatoes; add it to sautéed zoodles; spread it on hard boiled eggs; use it to top a burger; or toss it with shrimp or chicken and grilled bell peppers. There are really so many things you can do with it and it always elevates the dish to that next level. juice from 1/2 a lemon, about 2 Tbsp. 1) Place all of the ingredients, including 1 Tbsp. of olive oil, into the bowl of a food processor. Begin processing and drizzle the additional 3 Tbsp. of oil slowly through the chute, allowing the pesto to come together. 2) Taste and adjust seasonings, adding a little more salt or lemon as needed. What’s creamy and flavorful and makes everything taste better? Ranch dressing of course! Unfortunately, that stuff that comes in the bottle at the grocery store has far too many strange ingredients for me. 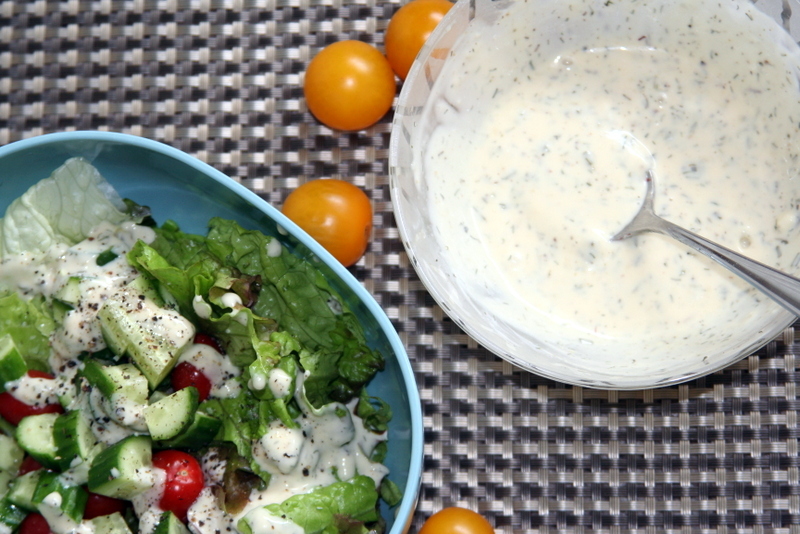 And salad dressings are so easy to make at home that it really is worth giving it a try. 1) Put mayonnaise in a small bowl and add the lemon juice, vinegar, garlic powder, and onion powder. 2) Measure out the thyme, dill, and chives and add them while rubbing them together in your hands to break them up a little and release their aroma. 3) Stir to combine, add salt and pepper, and allow to sit for 10 minutes. Taste and adjust seasoning to your taste. Eat with crunchy salads, veggie slices, or even drizzled on eggs. I haven’t purchased mayonnaise in over a year. 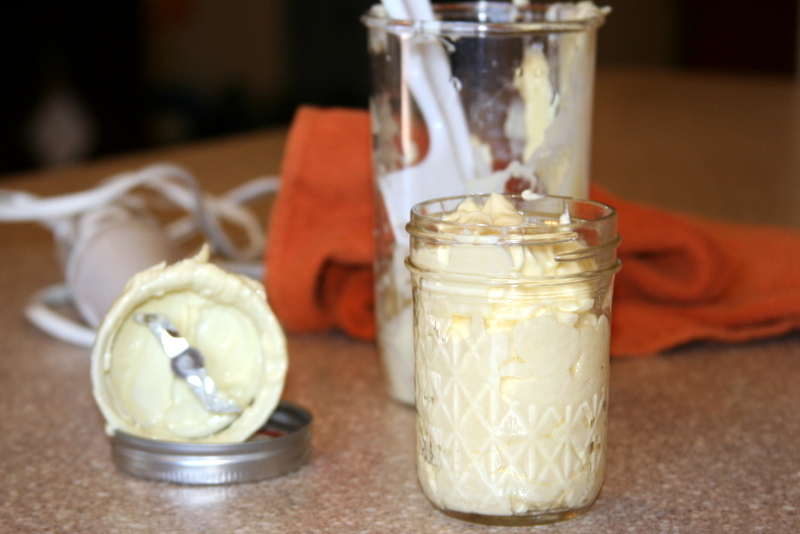 When I discovered how simple and delicious real, homemade mayonnaise could be, I ditched the jar of processed spread with canola oil and stabilizers immediately. For a little while, I kept a jar in the fridge for my husband and son, but when it was gone, that was it. And we’ve never looked back. Mayonnaise makes a creamy dressing, a flavored burger topping, a drizzle that elevates a meal – it is the little black dress of condiments. If you have an immersion blender and tall cup, like the ones in the picture, you can make mayonnaise in 10 seconds, and that includes transferring it to a jar. Once you have mayonnaise, you can add garlic or chipotle peppers and lime or fresh herbs, the possibilities are endless. I use Melissa Joulwan’s mayonnaise from Well Fed as my base recipe with a bit less oil because it fits better in my jar. So get an immersion blender and make your own mayo for your health and your taste buds. 1) Crack the egg in a tall container. Add salt, mustard powder, lemon juice, and olive oil. Walk away for 30 minutes to let it all come to room temperature. 2) Put the stick blender all the way to the bottom of the container. Start blending while lifting the blender to the top. The mayonnaise will come together immediately and be creamy and beautiful. 3) Scoop/Pour the mayonnaise into a glass jar and store in the fridge. That’s it! It may not be Thanksgiving anymore, but it’s still the holidays and if you plan on having turkey at any point, it would pair perfectly with this! 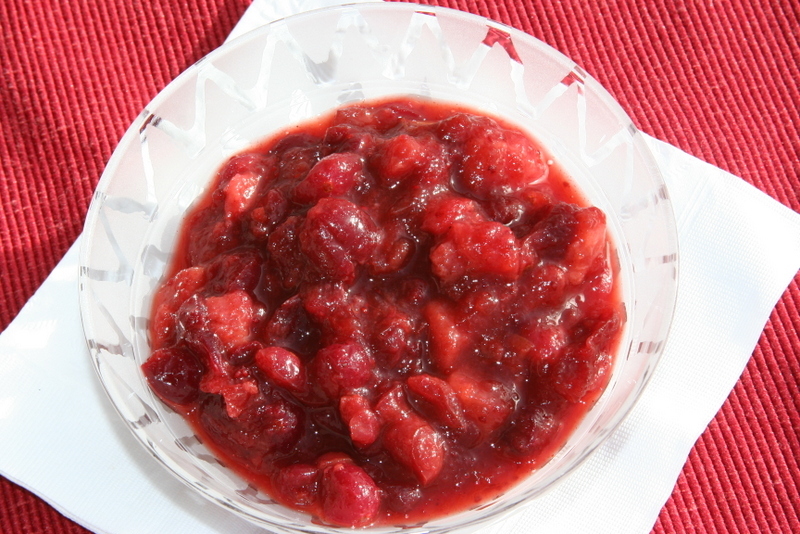 I have been looking a long time for a cranberry sauce that tastes better to me than straight-up cranberries and sugar. Over the years, I have tried many different variations because I truly believed there was something just a little more complex out there. At the same time, though, I didn’t want something that messed with the beauty of simple cranberries and sugar. If I was going to add something, it had to make the basic better. Then my very dear friend introduced me to her cranberry sauce. It’s incredibly simple, adding just three extra ingredients, but those three ingredients elevate the simple to the sublime! They bring just the right touch of sweet, spice, and complexity. I was completely blown away. I immediately asked her for the recipe, which she graciously shared, and now I’m sharing it with you! There was one other catch, though, which I’m sure you can guess. Paleo and sugar don’t really go together, but cranberries are so tart that you really need something to take the edge off. In comes palm sugar. Palm sugar is high in nutrients and relatively low on the glycemic index, but really, it’s still sugar. I like my cranberry sauce on the tart side, but regardless, it’s an accompaniment and not intended as a bowlful for dessert. Although I think it’s that good! I have tried this on a number of different things lately so don’t think you have to have turkey to give it a go. I’ve already had it on eggs and in greens. Let me know if you try it on something unusual. I’m always up for something new! 1) Boil water with the palm sugar, ginger, cinnamon, and salt until the sugar and salt are dissolved. Stir in pears and cranberries and return to a boil. 2) Reduce heat to medium-low and cook, stirring occasionally, until 2/3 of the berries are opened, about 20 minutes. Serve at room temperature.